What's not to love about luscious strawberries dipped in decadent chocolate? Nothing, except the price. So, you'll be happy to know how easy it is to make chocolate-covered strawberries yourself for a fraction of the cost of store-bought. Impress your sweetie for less? Sold! Here's create the best homemade chocolate-covered strawberries. Your chocolate-covered strawberries will only taste as good as the ingredients you use, so get the best you can. Bigger berries don't always taste better, especially if they're not in season. Go ahead and taste one before you buy. Choose berries with no soft spots, and fringed with fresh green leaves. Bonus points if they come with a stem attached. Stems make an attractive presentation and they're handy for dipping—just trim them to a uniform length. No stems? No problem—we'll deal with that later. Same goes for the chocolate. Whether you use dark, milk, or white chocolate, choose something you've tasted and liked. Better quality chocolate contains more cocoa butter, and will be smoother and glossier when it melts. To keep berries fresh, plan on dipping them within two days of buying them. More: Learn how to choose the right chocolate for your recipe. 1) Rinse berries under cold water and dry thoroughly, even the leaves. Important: You'll want to make sure not the slightest drop of water comes into contact later with your melted chocolate, otherwise it will go from silky smooth to thick and grainy in an instant. Set the washed and dried berries on a perfectly dry towel and let them come to room temperature while you prep the baking sheet and the chocolate. 2) Line a baking sheet with parchment or waxed paper. Use a large enough pan to allow an inch or two of space between the strawberries. If you plan on coating dipped strawberries with finely chopped nuts, sprinkles, coconut flakes, crushed candy, etc., prep them now and put them in bowls. 3) Melt the chocolate. This video shows you two easy ways to melt chocolate—in a bowl set over hot water, or in the microwave. The key is to go low and slow for a smoother melt. And I can't say this enough: Do not let any water come into contact with the chocolate. Some people add shortening to the chocolate to make it smoother, but this isn't necessary if you're using a good quality, high cocoa fat chocolate. 4) Dip the strawberries. The chocolate should be warm, not hot. Working one at a time, pick up a strawberry by the stem, or insert a skewer or toothpick into the top, or just pick up by the leaves. Dip into the chocolate, bottom first, to about ¾ of the way up. Gently rotate the strawberry as you pull it out of the chocolate, so the excess drips back into the bowl and the last drip rolls onto the strawberry. Optional: Dip the strawberry into the nuts, sprinkles, etc. that you've prepped. Instead of rolling, use a small spoon to scoop the ingredients over the wet chocolate. Place the strawberry onto the lined baking sheet. Repeat until all the strawberries are dipped. For this pretty pastel version of chocolate-covered strawberries, you'll dip your washed and dried strawberries in a bowl of microwaved candy melts. Check out the recipe for full instructions. It's a good thing chocolate-covered strawberries are so easy to make, because you can't store them for long. One or two days in an airtight container in a cool spot is about the limit. Don't store them in the fridge, though—they tend to "sweat." 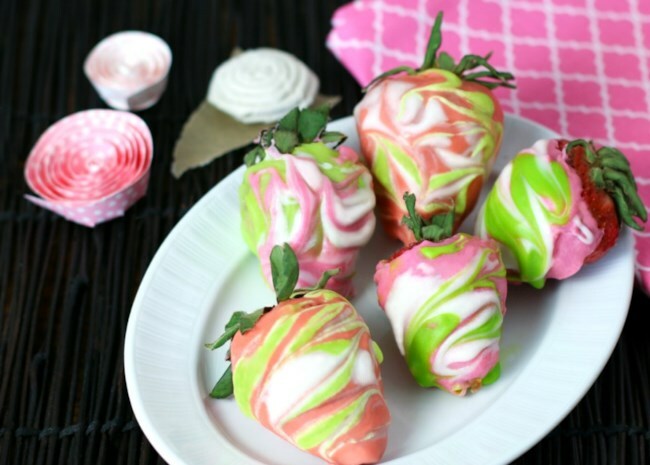 An easy way to dress up chocolate-dipped strawberries is by drizzling them with white chocolate. To do this, let the dark chocolate cool and harden around the strawberries while you melt the white chocolate. You could set the baking sheet in the refrigerator for a few minutes. Melt the white chocolate using the stovetop or microwave method, and let it cool slightly before spooning it into a pastry bag fitted with a small writing tip. You can also use a resealable plastic bag — just snip a tiny bit off one corner after filling the bag. Squeeze a fine thread of melted chocolate over the strawberries. Let the white chocolate cool and firm up before serving the decorated strawberries. Drizzle: Dip ¾ in dark chocolate, let it harden before drizzling with white chocolate. Double-Dip: Dip ¾ in white chocolate, let it harden before dipping ½ in dark chocolate. Tuxedo: Dip ¾ in white chocolate, let it harden before dipping at a 45 degree angle from side to side in dark chocolate. Pipe on dark chocolate bow tie and buttons. Pretty in Pink: Dip ¾ in white chocolate, dip in bowl of pink sugar before white chocolate hardens. Red, White & Blue: Dipping ½ in white chocolate, dip bottom in blue sugar before white chocolate hardens. Berry Happy Birthday: Dip ¾ in dark or white chocolate, let harden before piping letters on in contrasting chocolate. Now go impress someone special with a gorgeous batch of homemade chocolate-covered strawberries. More: See our entire collection of Valentine's Day recipes. • Love is in the air (and on a plate) with these decadent Valentine's Day dessert recipes. • Get ideas for cute and easy Valentine's Day treats. • Here's another way to enjoy chocolate and strawberries: Chocolate Fondue.